Winter may still have its cruel grip on the Twin Cities, but you don’t have to wait for the snow to melt to begin planning the addition of a pool to your yard. And chances are our Minneapolis area pool installation contractor has some great ideas to get your imagination heated up. 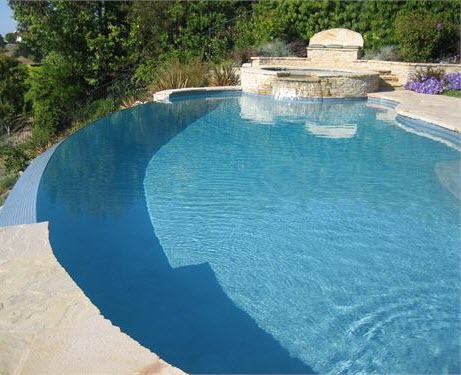 One of the most popular pool ideas today is something called an infinity pool. The infinity pool is a design that is strategically placed by a contractor to appear as though it stretches on endlessly, often giving the impression that it merges with a larger body of water, such as an ocean. An infinity pool appears to have no edge. First gaining popularity in the 90’s, this design has since been adopted by a number of luxury resorts, who wisely feature their infinity pools in pamphlets and other material that promotes their resorts. This lovely idea can work for homeowners as well. But there are a few potential obstacles that should be kept in mind for any homeowners looking to spice up their yards with this spectacular design. When installing an infinity pool, care should be taken with respect to the view beyond the pool’s edge. It is vital that there is something beautiful beyond the edge to which the eye is drawn. A neighbor’s house, a privacy fence or an empty lot will probably not create the look you are seeking. Natural landscapes like the the open sky or a wooded lot in the distance are preferable; you want the view beyond the water to be enticing. Homeowners interested in this particular design should consider that the price of an infinity pool is a bit higher than those of a conventional pool. But there is a very good chance that they will feel the effect is worth it. As for the size, some pool companies have created standardized infinity pool designs to make them more accessible to most consumers. Care should be taken to make sure you find the fit that is right for you! If you’re thinking that adding an infinity pool to your Minneapolis area yard could be just the special look for your home, contact us to discuss the possibilities. We are MN landscape design architects who delight in turning landscape dreams into reality, and that includes MN pool design and installation. Call us today – 952-272-7717.